Investors chose to focus on short-term cost challenges last month rather than on iRobot's healthy sales growth. Robotic cleaning device specialist iRobot (NASDAQ:IRBT) trailed the market by a wide margin last month by falling 20% compared to a 7% slump in the S&P 500, according to data provided by S&P Global Market Intelligence. Shares remain in positive territory for the year, though, up nearly 30% compared to a 2% uptick in the broader market. 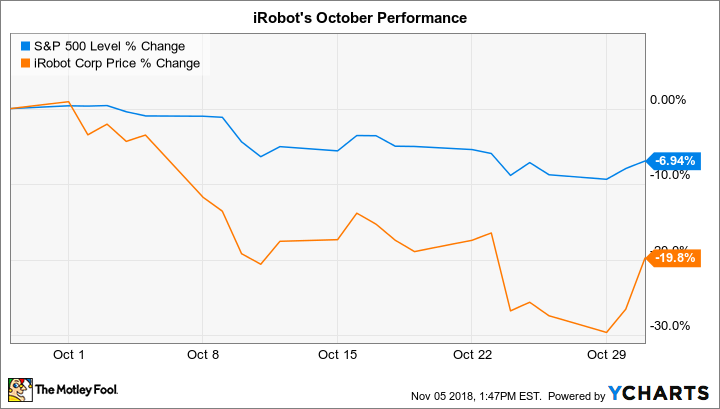 October's drop was driven by investors' harsh reaction to iRobot's third-quarter results. In that announcement, the company revealed healthy sales growth that reflected market share gains. Profitability expanded as well, suggesting that the flood of new competition hasn't hurt the industry leader. However, costs are projected to spike as tariffs eat away at earnings over the coming quarters, management said. iRobot can't do much about world trade challenges. But the company can continue to innovate, both in its cleaning devices and in its retailing and development partnerships. Shareholders are seeing progress on both scores lately, with two new devices going for sale over the key holiday shopping period and with a new collaboration with Alphabet set to deepen its smart home efforts. The success iRobot has in these areas will be more critical to its long-term ambitions than any temporary cost spike would be.